Well, it’s finally here! After 5 years of no Wario games and a whole handheld console generation without one in sight, WarioWare Gold has finally been released for the 3DS. 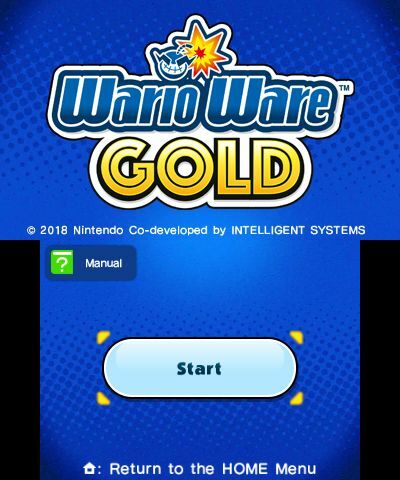 And with over 300 microgames, numerous extras and unlockables celebrating every part of the franchise’s history, it’s clear Nintendo is aiming for WarioWare Gold to be every Wario fan’s dream WarioWare title. But does it live up to the hype? Is it the gold standard for the WarioWare series, or is it another disappointment like WarioWare Snapped and Game & Wario before it? Let’s find out, in our all new review of WarioWare Gold for the 3DS! Starting with the visuals of the game. How appealing does WarioWare Gold look in general? 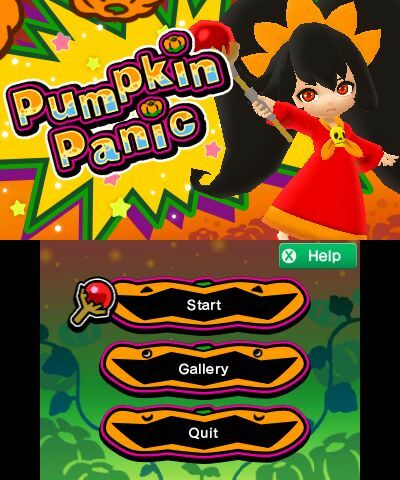 Well to be honest, about as appealing as every other WarioWare game does. It’s a series that’s never exactly been a graphics powerhouse, and it’s one that doesn’t need much beyond appealing cartoony visuals to do its job. And in that sense? WarioWare Gold does its job perfectly. The cutscenes are nice enough and look charming, the microgames retain the quirky mix of visual styles the series is known for and everything looks as polished as can be for this sort of title. It’s not gonna compete with something like Luigi’s Mansion 2 or Mario Kart 7 or the Mario & Luigi series’ pixel art, but it looks great regardless, and does exactly what you need it to do. To the sound department, where things actually get a bit more interesting than the past titles. Why? Because unlike said titles, WarioWare Gold has full voice acting for all major characters and cutscenes. What’s more, it’s not even the ‘couple of treehouse members’ style cheap voice acting from previous titles either, with the voice acting actually being done by professionals with experience in the industry. In that sense, it’s quite the step up. As you can tell, they generally do a pretty good job for the most part. This ain’t no Mario Sunshine esque deal where Bowser sounds like Cookie Monster, this is actually decent voice acting that compliments the game’s cutscenes perfectly. Well, for the most part that is. 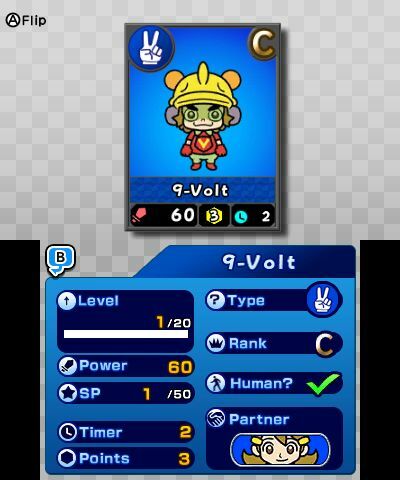 Because unfortunately, while most of the voicework here is indeed top notch (with 18-Volt, Dribble and Ashley being some sort of the standouts), some of the others is perhaps a little less so. Like how Jimmy T sounds less like a suave disco dancer and more like a generic everyman, or how 9-Volt sounds just a bit too much like an average kid. Don’t get me wrong here, they don’t sound bad or anything, just not ideal for their roles in the game. Still, even if the voice acting isn’t perfect, you certainly can’t fault the music or other sound effects in this game one bit. That’s because WarioWare Gold has quite literally the best soundtrack in the series bar none. And that’s because in this title, every classic WarioWare tune you can think of returns. Ashley’s theme? Check. Mona Pizza? Check. Tomorrow Hill and Four Seasons? Check. The records section for the title is a literal museum for classic WarioWare music, with basically every memorable tune you can think of making a comeback here. It’s amazing really. 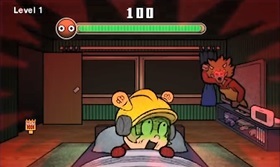 The microgame background tunes and cutscene songs are neat too, though neither are played long enough to leave much of a lasting impression due to the gameplay style. Either way, it’s a good soundtrack, and it’s the best one in the series bar none. Since WarioWare Gold is basically the best bits of the WarioWare series in one game, with all the modes, control schemes and mechanics to match. As ever, the aim to complete all the random microgames thrown at you in the story, with the game speeding up after every four or so are completed and getting more difficult after a longer boss game. And also as ever, this means doing whatever random things the game throw at you, since you have no idea what style of gameplay will come up next. You might be dodging traffic, keeping a cat from getting wet via an umbrella or picking a giant nose, it’s all there and hilarious in its sheer absurdity. 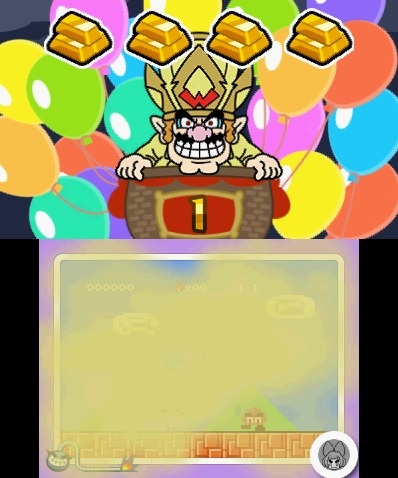 But WarioWare Gold goes further still with the randomness. That’s because as mentioned before, all control schemes from past games return in this one. That means at any one time you could be mashing buttons, tilting the console, touching the screen or even blowing into the microphone, all while not knowing what control scheme may pop up next. Well okay, maybe not for the first part of the game. In that one, the microgames are all sorted by control scheme and each row’s sets are based around a single control scheme (buttons, gyro and touch respectively). But the point still stands, since later on things get mixed up, and your concentration will become a definite necessity if you want to stand a chance. Yet the insanity doesn’t stop there either. Oh no. 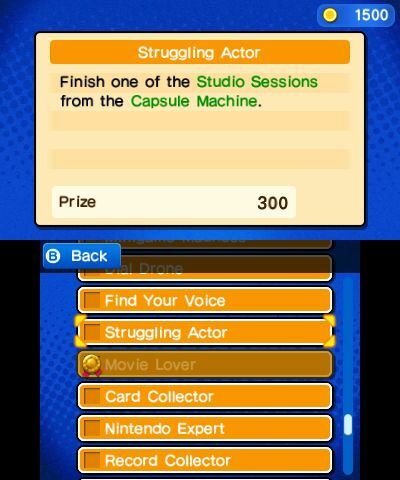 That’s because beating WarioWare Gold unlocks a new challenge menu, which comes with a new set of special challenges to take on. And then there’s other random craziness like Cruise Controls (the speed Dribble and Spitz’s taxi goes changes when you tilt the system and the microgame speed changes to match), Battle Time (fight someone else by competing in WarioWare games) and Split Screen (where microgames alternate between the top and bottom screen, with little time to prepare). It’s a great set of options that really takes the formula and does almost every conceivable thing with it, turning an almost wacky experience into drug fuelled insanity. As for the actual storyline of the game… well it’s basically just an excuse for wacky hijinx and jokes really. 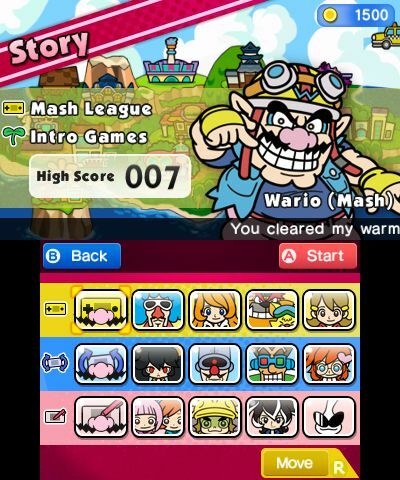 Wario sets up a tournament with a 10-million-coin prize as a way to make money, and that acts as the overall narrative for the game, with the first sets in each row being set at the tournament along with the final boss challenges. 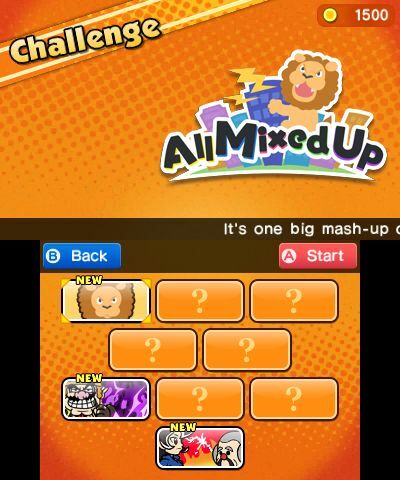 However, what happens in between those sections is basically complete randomness in the standard WarioWare fashion. These in between sections all follow the actions of one or more members of the WarioWare cast as they go about daily life in Diamond City, with the setups being the kind of premise you might see in a surrealist cartoon show. 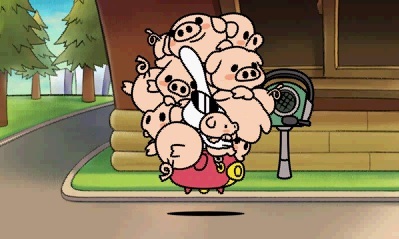 For instance, you’ve got Jimmy T becoming popular after a cat somehow ends up his air, Dribble and Spitz shooting down UFOs in their flying taxi and Orbulon trying to collect pigs for a fast food restaurant, since apparently, he thinks McDonalds kills and cooks their food on site. 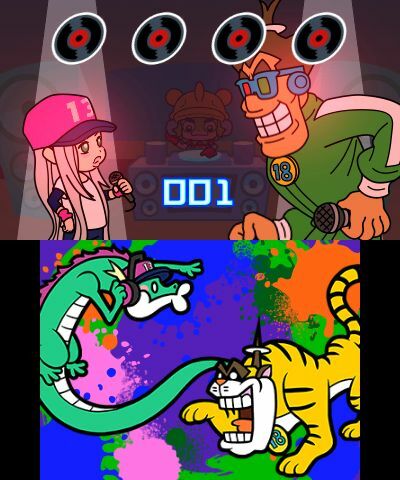 It’s all funny to watch (and the perfect premise for a future WarioWare cartoon show, hint to Nintendo), but it’s mostly just icing on the cake overall. Finally, you’ve got then got a bunch of miscellaneous extras called ‘souvenirs’, which you unlock throughout the game or by ‘buying’ them with in-game currency from a capsule machine. 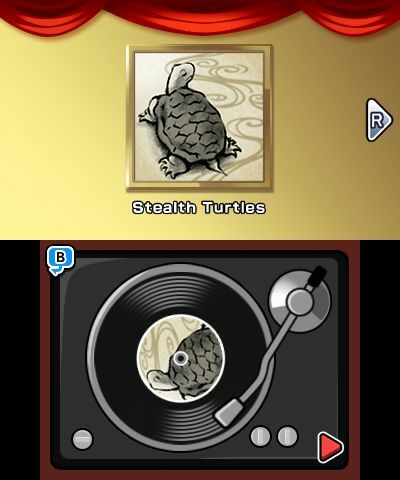 These have no connection to anything else in the game, but do act as amusing distractions none the less, with your rewards being everything from mini games starring the characters (Pumpkin Panic et all) to Nintendo trivia cards and even virtual games consoles to play WarioWare on. 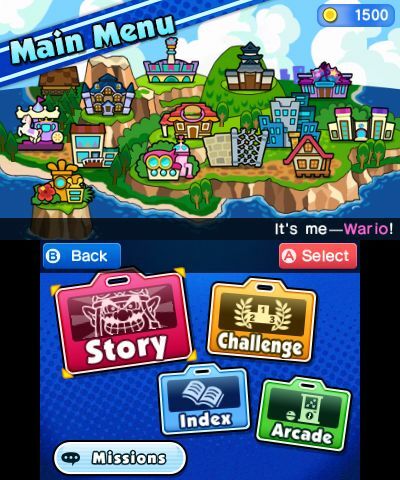 You know in case you wanted to play WarioWare Gold on a virtual 3DS inside WarioWare Gold! All in all, it’s a fun game with plenty to keep you occupied and a decent sense of humour to keep things fresh. But how does long it last exactly? Well to be honest, that depends significantly on what type of player you are. You see, as a rule, Wario games are neither particularly challenging nor take particularly to beat. 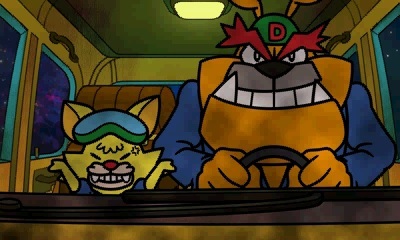 They’ve got some difficult extras and side missions sure, but generally you’ll have polished off the main storyline in round about an hour or two, regardless of whether you’re talking Wario Land or WarioWare. And WarioWare Gold isn’t an exception to that rule. It’s got a few more stages and the odd microgame may be a bit trickier than say, WarioWare Touched, but for the most part, the main game is an easy experience you’ll blast through in no time. Which in turn is made even more obvious by the extremely lax continue system the game gives you in general. This is because unlike in previous WarioWare titles, losing all your lives doesn’t necessarily mean starting the stage over. Instead, you can just pay 100 coins or so to continue on the spot, meaning that that anyone with the money can keep going for as long as they pay up. 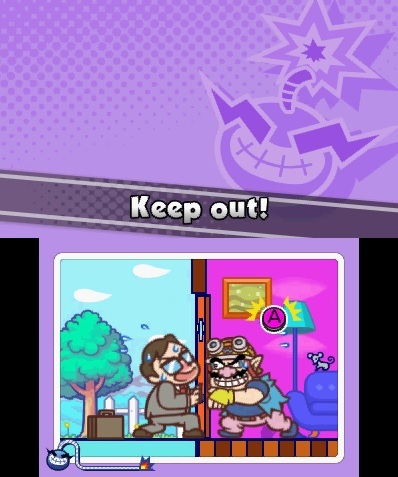 And that’s not exactly difficult to do here, since money in WarioWare Gold is given out like candy. Beat a stage? That’s around 300-600 coins or so. Beat your high score? Probably another 100 or so coins for that. Etc. Hence anyone who’s decent at the game should be able to clear the whole thing in about an hour or two without much difficulty. 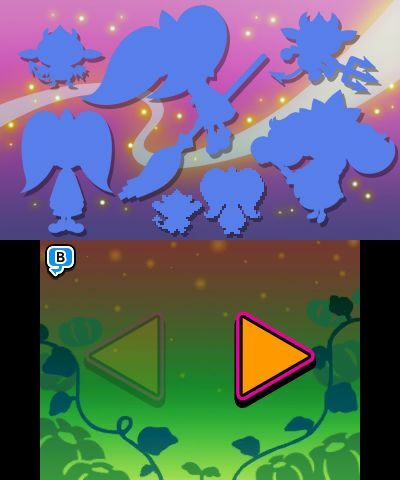 For a ‘once and done’ story mode player, WarioWare Gold is not going to offer them much of an experience. Plus, a whole ton of missions requiring you to beat certain scores, unlock all games by category, not mess up once, etc. There’s a ton of content here, and for the completionists out there, it’s enough to extend the playtime from about 2 hours to around 20-30 or so, depending on your skill level. 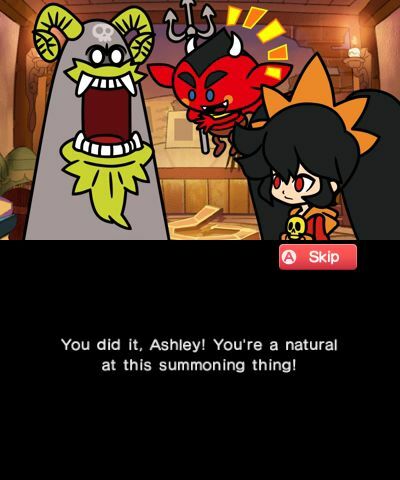 Oh, and the mini games also have unlockables too, like Ashley’s Pumpkin Panic game letting you earn the Ashley themed badges from Nintendo Badge Arcade to view in a gallery. It really is a game whose value is highly dependant on your playstyle, and one which completionists will enjoy a lot more than single playthrough gamers will. Still, enough about the extras for now, onto the final verdict! Which as you may imagine, is obviously going to be on the positive side. After all, we also run Wario Forums in addition to Gaming Reinvented, and we’ve been desperately hoping for the series to return ever since Game & Wario’s failure in 2013. But that doesn’t really matter, since overall, WarioWare Gold is a great game. Sure it’s the longest or most challenging one around, and its value will obviously depend on your playstyle, but it’s a fun experience none the less, and one that’ll keep completionists coming back for hours. So if you’re interested, check out it. It’s a great game and one that’s well worth digging out that dusty old 3DS to play right now!